As promised last month, here is one of the first interesting results produced from the Human Resources Metrics Service database. What this chart indicates is a clear relationship between what an organization spends on HR and the level of resignations it experiences. This chart continues to build the evidence that the way you resource and deploy the HR group in your organization makes a difference. Let’s take a detailed look at the chart. The horizontal axis plots what an organization spends on HR per employee per quarter. HR is narrowly defined, excludes payroll and learning and development costs. It does include all labour costs for HR staff, costs of programs, consultants costs, etc. The vertical axis plots the percentage of the organization that resigned—chose to leave—also on a quarterly basis. The data was collected over three years and represents twelve different sampling periods. There are over 300 separate samples on the chart. What the chart shows is that those organizations that spend less on HR, experience significantly higher levels of resignations. 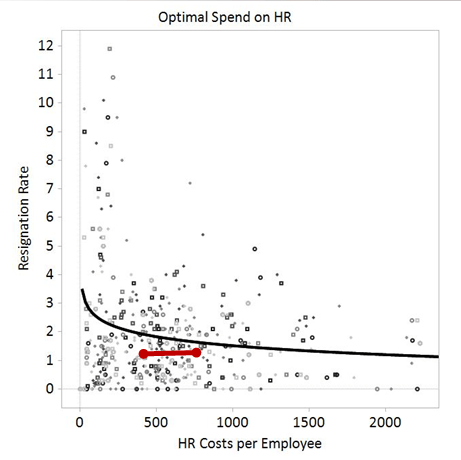 The dots clustered close to the vertical axis show resignation rates well above the average and an HR spend that is a lot lower than average. When you factor in what it costs to replace staff, then the organizations on the left side of this chart are spending more on replacing people than they would spend if they provided HR with the proper resources. For these organizations, spending more on HR is likely to reduce their resignation rate. More staff can lead to better recruiting and retention processes and therefore lower resignations. This in turn will save the often hidden costs of replacing people who leave. However the converse is not true. Those organizations on the far right hand side of the chart spend considerably more per quarter on HR than others. However they do not see a correlated drop in resignations. Hence the relationship between money invested in HR resources and resignations is not linear; that is, it is not true that the more you spend the lower your resignation rates. What is true is that you need to spend at a certain level in order to achieve a benefit in relation to resignations, and spending more does not bring additional benefits. In effect, there is an optimal range of investment. On this chart, this range is represented by the horizontal red bar. Given the current level of competition for resources, this data provides clear evidence that money spent on HR is related to positive outcomes. It provides a benchmark range from which HR groups can develop their budgets and demonstrate to the business the impact these budgets can have. For many working in the HR profession this is a step in the right direction. I assume that it depends what employers are spending their HR dollars on, as well?